The Gites: 1 bedroom, sleeping 2 people each. Plus a Bed and Breakfast Suite for 2 people. 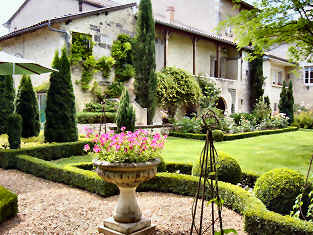 Situated in the heart of the little village of Agonac, 15 km north of Périgueux, this 16th century maison de maître is set in peaceful, shady gardens and comfortably furnished with family country furniture. 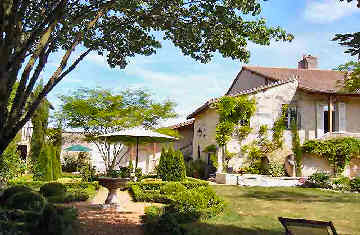 The house is ideally placed for exploring the Perigord Vert, an area of gentle wooded hills and hidden valleys, walnut groves, orchards and small farms. This area of South West France is rich with prehistoric, Roman and mediaeval remains, largely unspoilt and has relatively little traffic. Birdwatchers and nature lovers will be delighted by the rich diversity of wildlife on our doorstep, including wild boar and deer, nightingales, golden orioles and red squirrels, against a background of singing crickets. There is a wide choice of weekly markets to browse through in the towns and villages and good-value restaurants. This is foie gras and truffle country and Périgueux has several good food shops stuffed with gastronomic goodies. The old part of the town is pleasant to walk around and the cathedral, designed by the architect of Sacre Coeur in Paris, is a beautiful backdrop to the weekly markets, whilst the Roman temple is still imposing and in remarkably good condition. Gite Brantôme is entirely independent of the house. 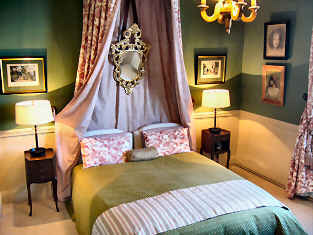 It has a lovely beamed double bedroom furnished with old country furniture and a living room with satellite television. The corner kitchenette is equipped with an oven and hob, microwave, fridge, kettle and coffee maker, there are ironing facilities and there is also a bathroom with shower. Internet access is available. Gite l'Echoppe has a pretty double bedroom with a shower room and a sitting room with television and a hi-fi, furnished with old family furniture. The kitchen has a dining area and is equipped with a hob and microwave, fridge and kettle. 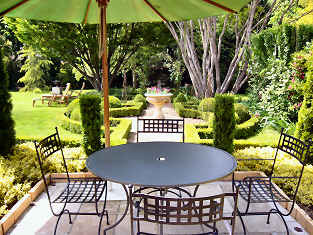 The garden has quiet shady spots under the lime trees and garden furniture. The Bed and Breakfast Suite is on the second floor of the main house and has a large double bedroom with television, lovely views and a little salon with a single bed if needed. The bathroom has a shower. Breakfast is served in the main house and dinner is available on request. 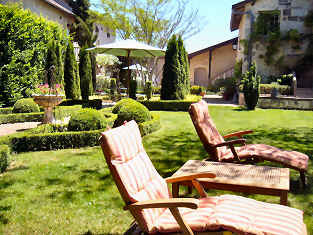 The garden has garden furniture and there is ample parking in the interior courtyard. Again, internet access is available. The village has tennis courts and you can walk almost anywhere you like. There is a choice of two riding stables within 10 kms, canoeing on the Dronne river 12 kms away and an 18-hole golf course 16 kms from here. The little island town of Brantôme is enclosed between two arms of the Dronne. Its five bridges and ancient abbey tucked under a cliff, the belfry reflected in the river, the old Virginia creeper-covered houses and the weeping willows and gardens, give it great charm. A good place to stop for lunch. If you follow the winding river from here, it will bring you to the village of Bourdeilles and the route gives you a fine view of it as you approach. The château, on a bluff above the river is part medieval and part Renaissance and has some fine rooms and period furniture. St Jean de Côle has a curious church, a Renaissance castle and medieval Périgord houses and is worth a stop just because its so attractive. On the way to Villars you will find one of the finest of all the Dordogne châteaux. Château de Puyguilhem was built in the early part of the 16th century, a contemporary of several of the châteaux of the Loire Valley. Near Puyguilhem, at the hamlet of Le Cluzeau, are the Grottes de Villars, caves with stalactite formations and a number of prehistoric paintings.